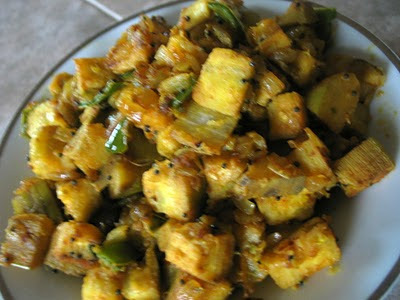 I think every body from south of India makes one or other version of kaya mezhukvarati.I love my mom's kaya thoran too. But there was time when i hated anything made of raw banana :). I remeber a classmate of mine used to bring banana kofta in her lunch box at school. Its been a long time since i have ever eaten any banana kofta. I must try to make it sometime.Banana Bajji sold by street vendors in bangalore is very tasty too. Hmmm writing this blog has inspired me to try some more banana recipes :) . I think must google and see what others are cooking up with banana and try some new recipes. 1. Peel the skin of the banana and cut into one inch cubes. 2. Take a saucepan wash and add banana to it. 3. Add to it 1/2 cup of water, salt ,turmeric ,slit green chilli. 3. Cook banana till fork tender.Drain and keep aside. 5. Heat oil ,add mustard to it and let it pop. 6. Add onion and curry leaves. Cook till onion is golden. 7. Now add chili powder and banana and mix everything well. 8. Cook for few minutes and serve with rice or chapati. It goes very well with mor or mor curry and rice. I just love banana fry ! looks yummy..